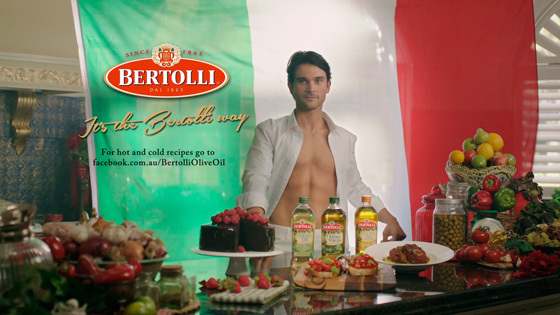 Janai and Margo worked on this Bertolli commercial that features Italian lover Alfredo Caldo-Freddo and his many olive oil cooking tips. Shot in an amazing property in Kenthurst with production design by Ella Carey this bountiful Italian feast sprawled out over the decadent mansion setting. Margo carefully tanned, airbrushed and contoured Alfredo’s torso to create this Italian god of cooking. Styling was minimal with crisp white separates and many repeats to survive the layers of bronzing. We hunted high and low to find the navy velvet smoking slippers, complete with gold barbed wire embroidery.